Talking to iDid using Alexa : iDid Inc.
Now you can use Alexa and issue contextually intelligent commands. Context is created and provided by the iDid app. Download and install version 15 or greater of the iDid application from the Google Play Store: iDid: Your Digital Avatar. 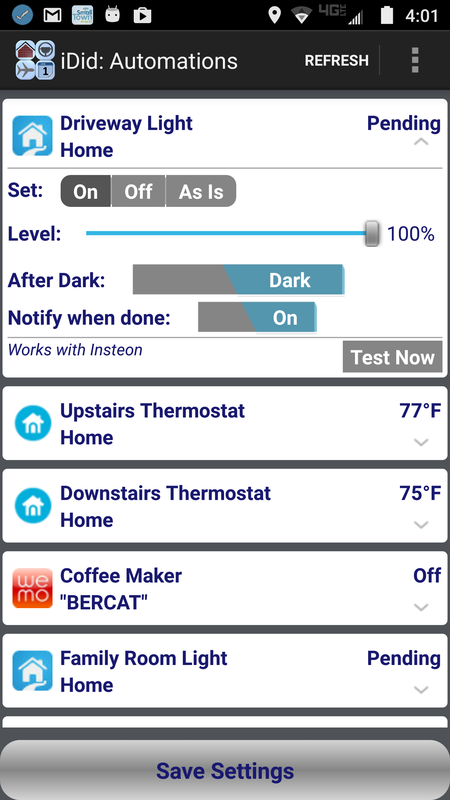 Note at this point the iDid-Alexa interface is only supported on the Android version of the app. For a quick overview of the iDid app, see http://idid-inc.com/idid. See how we can help you use Alexa in your business and contact us. 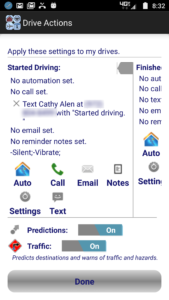 Install the iDid Android application. You will be taken through the welcome screens where you will select a Calendar for iDid to log events to. When you get to the Sharing Context screen you will be asked to log-in through Google. You will use the same login later using the Alexa app on your Android phone, so that both accounts are linked. Note that this is the email address others will use to share their location and context with you. This email is your iDid identity. Make sure this email address is in your phone contacts with your name, mobile number and preferably a picture. After iDid starts, it will show you your current location in the Activities view. Initially, you’ll see where it says, “No place name yet…”. Give it a minute or two to finalize your place and activity. 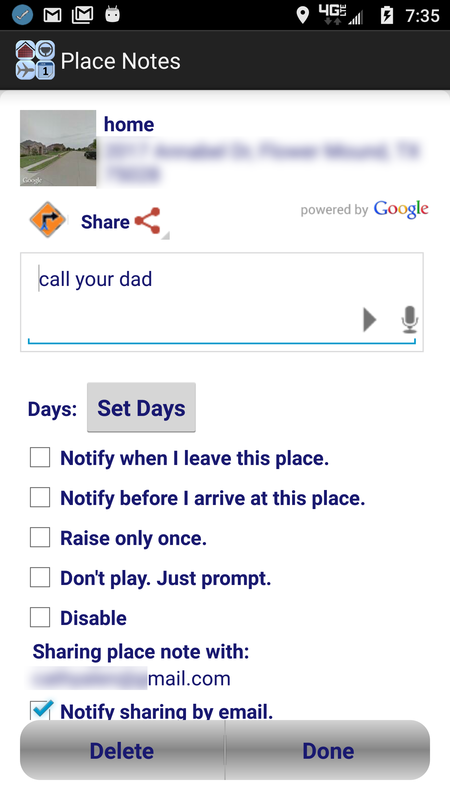 iDid will automatically customize place names for “home” and “work” as it learns in a day or two. However, to start testing the Alexa-iDid voice interface and try the examples below, create a custom place called ‘home’. 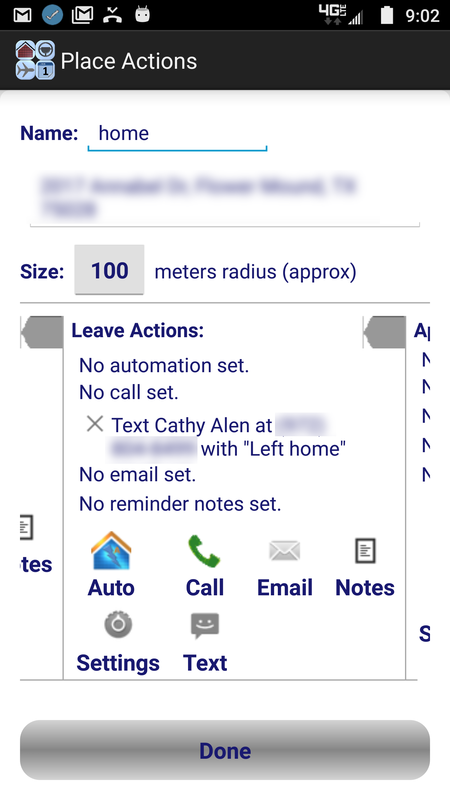 In the ‘Activities’ view, hit the ‘Actions’ button for your current activity (top-most for today) and customize the place on the following screen with an alias. Hit ‘Done’ to save. On your Alexa Android app, search for the “iDid: Your Digital Avatar” skill and install it. Link your Alexa iDid skill with your iDid app by logging in with the same Google account you used when you installed your iDid app. Do this by enabling Account Linking for the skill. 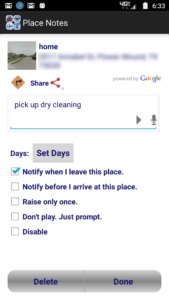 Once linked, you can give commands to your iDid app through Alexa. The invocation name is “my avatar”. Let’s say Bernie (me) is talking to the iDid app through Alexa. If you get this response that means that Alexa is able to communicate to your iDid app and the accounts are correctly linked. This very first command may take a few seconds longer than subsequent ones (to go through security protocols). You may get a response with a customized place name, a public place name or an address – or a combination. Your iDid app will launch in Map view and plot the person on the map as well. If you have a picture in your contacts, that picture will be used for the plot. Your phone rings. 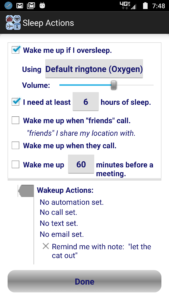 This works (rings) even if your phone was set on vibrate or silent. You can set up many smart reminders with iDid and now it’s even easier by simply talking to Alexa. 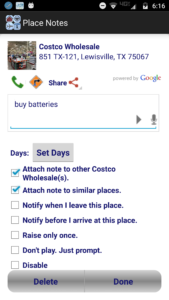 Smart reminders can be attached to places and events. See Contextual Triggers for a summary discussion on the kinds of triggers iDid supports. 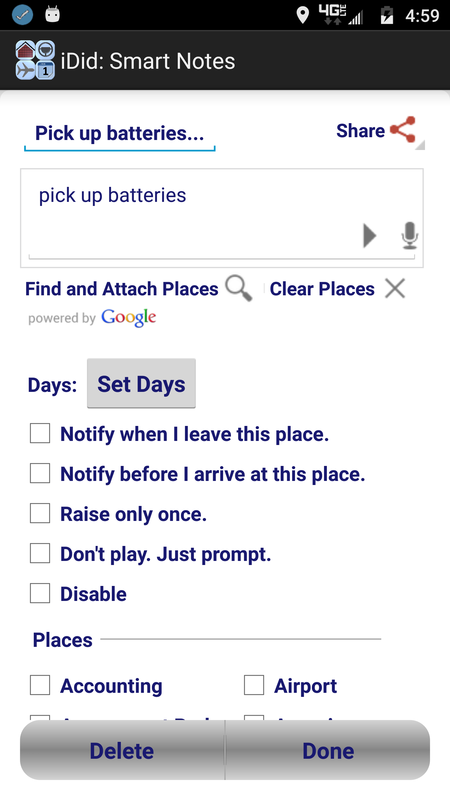 When attaching to places, you can configure them to activate when you are at that place or before you arrive or after you leave. Here are some examples below. 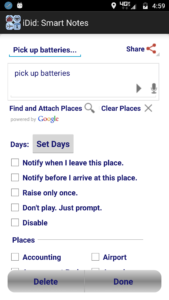 Note that as you issue these commands, corresponding screens pop-up on the iDid app (confirming your actions). 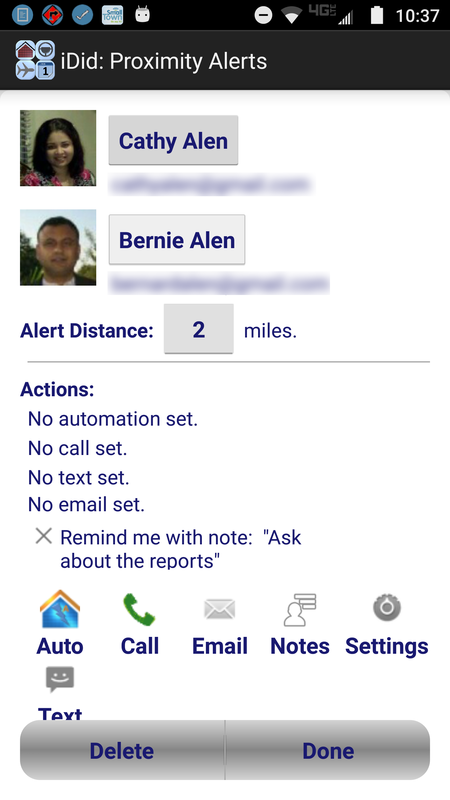 The iDid app will automatically detect and customize place names, “home” and “work”. 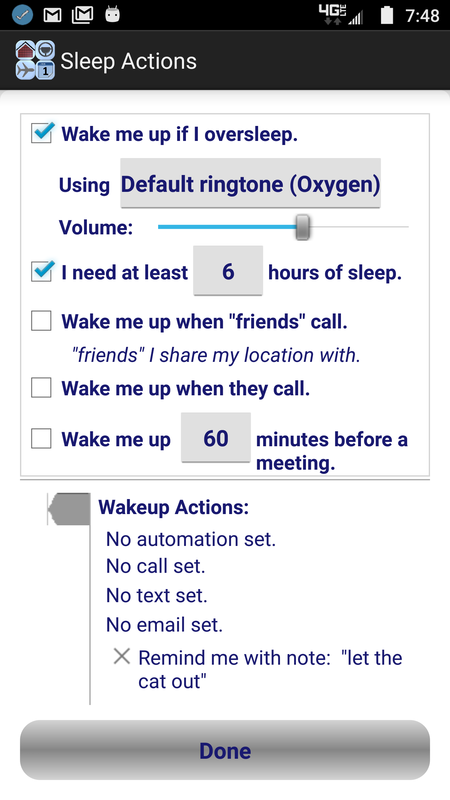 It may take a couple of days for the app to arrive at this customization automatically. 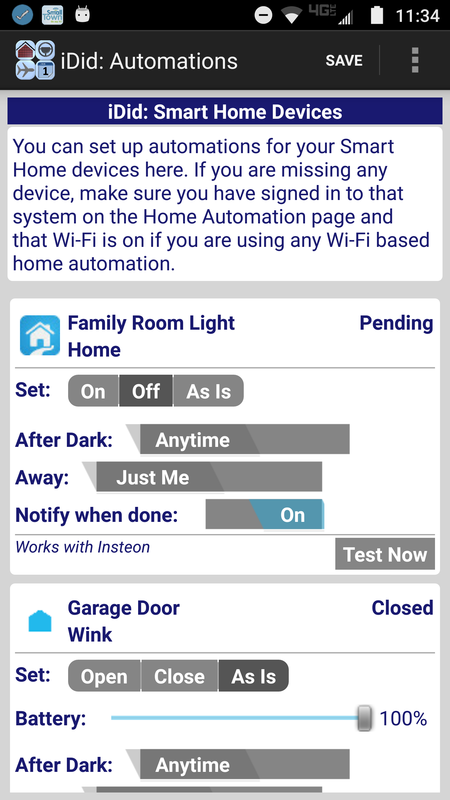 You can manually customize if you’d like to issue commands that use “home” or “work” in the meanwhile. Note that “Notify when I leave this place” is checked. iDid will remind you when it detects that you have just left home (assuming you issued this command at “home”). Try this: “Alexa, ask my Avatar to remind me to pick up pizza on my way home”. This time you are reminded before you reach home. 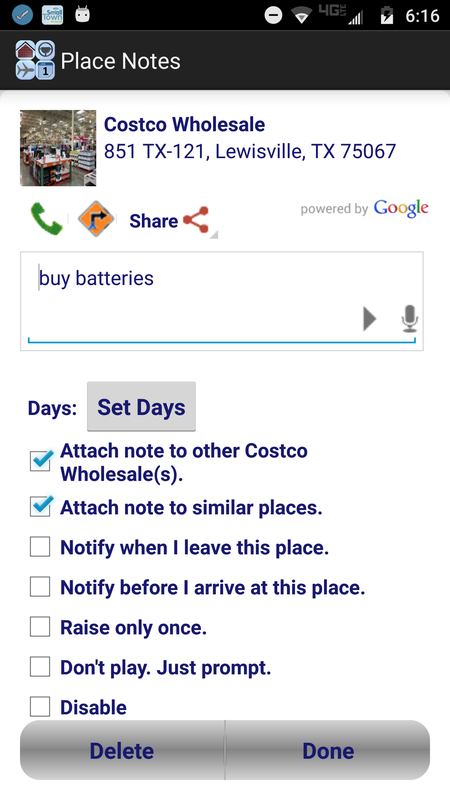 To summarize, with place based reminders you can attach a note to a place such that you are reminded when you are at the place, before you arrive or after you leave the place. 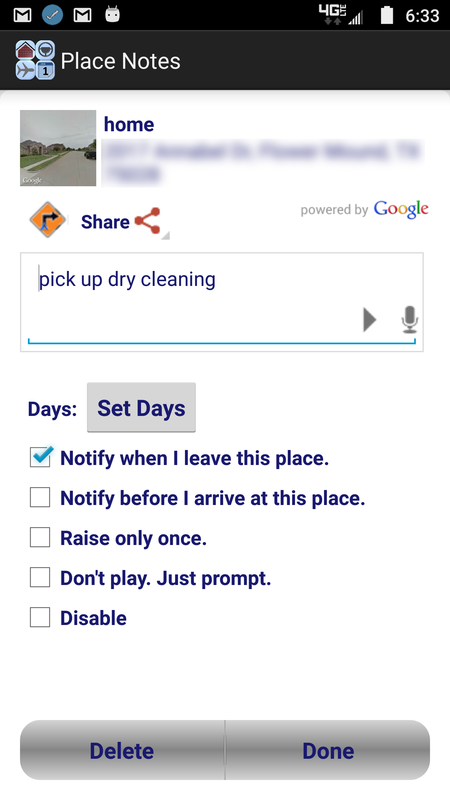 You can leave the place name out completely – to be reminded at places and times the app itself chooses based on the task. 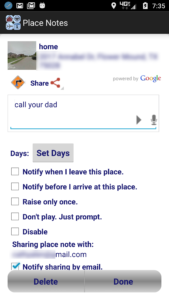 iDid is powerful as a family application. You can just as easily share notes with others in your family/friends network by issuing simple commands like the above through Alexa. Note that the note is shared immediately with the friend or family member but is triggered based on the specified condition – “when she gets home”, in this case. The note was created by Bernie and shared with Cathy. Both have the note attached to their home. The receiver gets a notification on their phone that they have received a note. It is up to the receiver to save it or delete it. 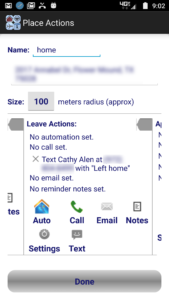 All place notes are shared as “notify only” as in they don’t automatically speak out. The receiver can turn them into audio notes. Note: You can use first names to reach someone by text if that person is sharing with you or you are sharing with that person. Otherwise, you will have to use their full name and that has to match precisely with a name in your contacts. This is to avoid texting someone inadvertently. 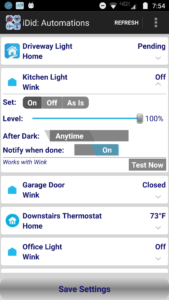 Alexa: “Okay.” (after driveway light is turned on by whatever controller you are using). 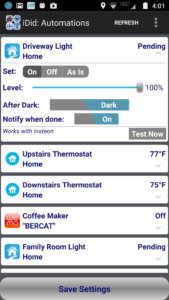 With the iDid application, you can create several rules to secure when and how commands can be issued to your Smart Home devices. These authorization rules are more significant when commands are issued through Alexa. Mark a device as “Secure” or “Open”. By default all devices except doors and locks are ‘Open’. Doors and locks are ‘Secure’ by default – which means you need to supply some kind of authorization to operate them, as explained below. Allow commands to this device only when “I am here” – which means you have to be physically at that location for anyone to issue a command either through Alexa or through your phone (“You are where your phone is”). 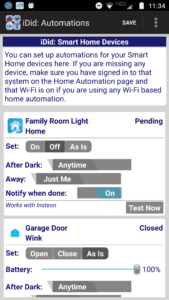 Allow commands to this device only when your family is here. In this case, “family” are the ones you are sharing your location with and they are sharing with you as well. “State Recent Place”: Instead of an authorization phrase you can state a recent place you visited. You will need to figure out, of your recent places what place names the app accepts as valid for authorization by trial and error. For instance: “Turn the fireplace on; authorization: Great Clips”. “Apply to”: For a device, not all functions may have to be secured. For instance, for a lock you may want to secure unlock but allow anyone to be able to lock (perhaps). Select the function you want to secure in the ‘Apply to’ option. Note that for devices that are marked ‘Secure’, every selected rule must pass. 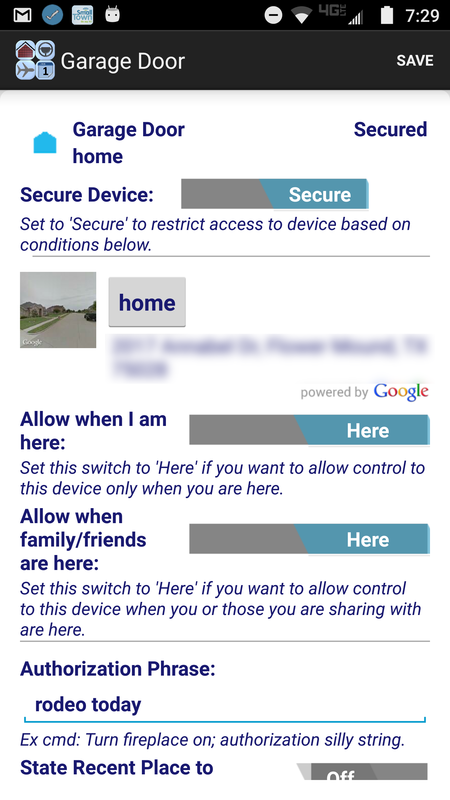 For instance, if you have place based control and an authorization phrase set up, both must pass. For the first command, authorization must pass for immediate execution of the command. For the second command authorization must pass for setting up the condition that will trigger the execution (not the execution itself). 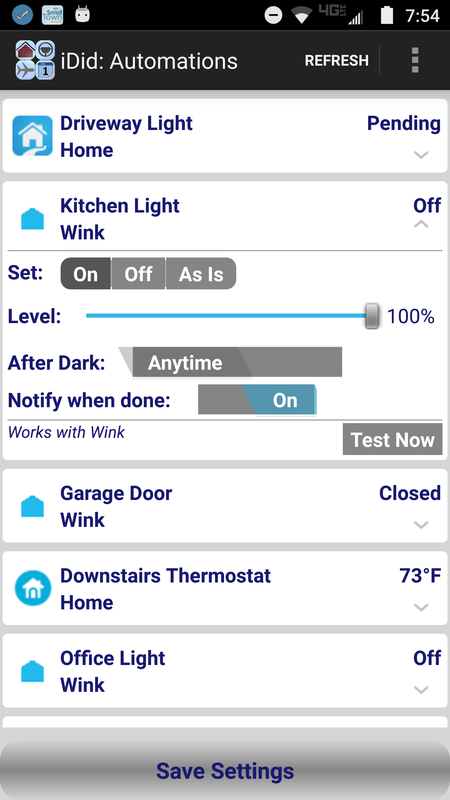 If authorization was passed and the condition was set up, kitchen light will turn on when you come home – in that example. 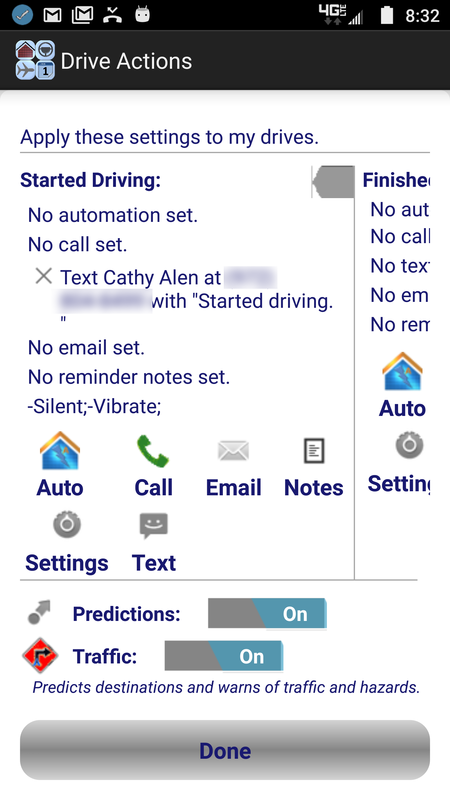 If you are heading out to your next meeting and want to pull directions on your mobile before you start driving, try the commands below. First, on your iDid app, open Automations, Meetings and select the calendars where your meetings are. Set up a few upcoming meetings to test. Alexa: “Hi Bernie. What can I do for you? When these commands are issued, iDid checks to make sure the place is open and gets traffic information. 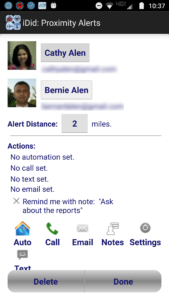 If you have turned on expense reports on your iDid app, you can issue commands such as the ones below. Expense reports are currently available only to JP Morgan Chase customers with email alerts set (alerts must be received on the account you use to log in while enabling this feature on the iDid app).